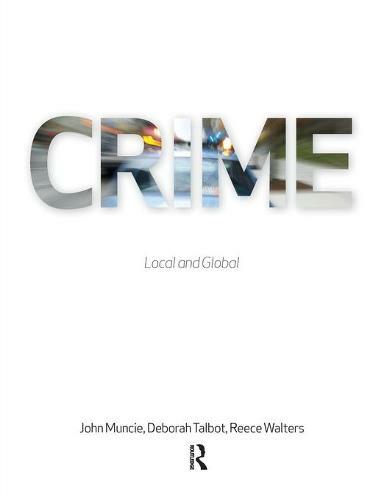 Crime: Local and Global and its sister text Criminal Justice: Local and Global are two new teaching texts that aim to equip the reader with a critical understanding of the globally contested nature of 'crime' and 'justice'. Through an examination of key concepts and criminological approaches, the books illuminate the different ways in which crime is constructed, conceived and controlled. International case studies are used to demonstrate how 'crime' and 'justice' are historically and geographically located in terms of the global/local context, and how processes of criminalisation and punishment are mediated in contemporary societies. Crime: Local and Global covers the way local events (such as prostitution) have wider aspects than previously thought. Links with people traffickers, international organised crime and violence cannot be ignored any longer. Each crime or area of activity selected within this text has a global reach, and is made ever more possible due to the way globalisation has opened up markets, both legitimate and illegitimate. The book's approach and scope emphasises that we can no longer view 'crime' as something which occurs within certain jurisdictions, at certain times and in particular places. For example, the chapter on cybercrime highlights the 'illegal' acts that can be perpetrated by second lifers, anywhere in the world, but are they a crime?